:: Question of the Day - Dry Skin - Help! :: Treatment of the Month - Get A Gift for After the Holidays! Thank you for helping Raspberry Moon stay strong for another year. I am so thankful to have such wonderful clients and friends. I am looking forward to helping you look and feel your best in 2010! May you have a safe and blessed holiday season - however you choose to celebrate. Under the Roman Emperor Diocletian, who ruthlessly persecuted Christians, Bishop Nicholas suffered for his faith, was exiled and imprisoned. The prisons were so full of bishops, priests, and deacons, there was no room for the real criminals-murderers, thieves and robbers. After his release, Nicholas attended the Council of Nicaea in AD 325. He died December 6, AD 343 in Myra and was buried in his cathedral church, where a unique relic, called manna, formed in his grave. This liquid substance, said to have healing powers, fostered the growth of devotion to Nicholas. The anniversary of his death became a day of celebration, St. Nicholas Day. When I lived in Germany as a kid, we would celebrate St. Nicholas Day by putting a shoe outside of our bedroom door so St. Nicholas could leave us something small - or switches and coal if we were bad! Our version of today's Santa Claus in the US as a big, jolly old man in a red suit was started by Coca-Cola although there were versions of a jolly old elf starting in the early 1800's. The jolly elf image received a big boost in 1823, from a poem destined to become immensely popular, "A Visit from St. Nicholas," now better known as "The Night Before Christmas". Check out http://www.stnicholascenter.org for the interesting story of St. Nicholas and Santa Claus. Question of the day - Dry skin - HELP! Ok... You are thinking to yourselves, "I know how to moisturize my skin. When my skin is dry, put lotion on it and that's that! What's the mystery?" 1. One of the biggest misconceptions about moisturizers is that these products hydrate the skin. The truth is that moisturizers lock in the skin's own moisture to prevent dryness and cracking. 2. The more oil a moisturizer contains the more effectively it protects against moisture loss. 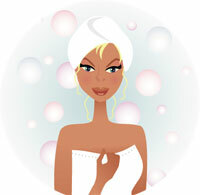 The primary ingredient in most lotions is water, which is not very effective in protecting skin against moisture loss. 3. When the relative humidity drops below 60%, skin begins to lose moisture and greater protection against moisture loss is needed. In humid conditions, the skin can replenish itself by soaking up moisture from the air so a lotion may be all that is needed. 5. Use moisturizers which are pleasing to the skin to encourage use. If your skin feels soothed and smooth, you definitely will use it! Compliments of The Body Patisserie. 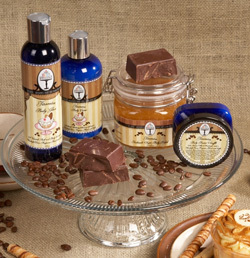 Product of the Month - Body Care by The Body Patisserie - Y-U-M-M-Y! Strawberry Custard Tart - this heavenly scent of ripe strawberries and rich vanilla custard takes your soul to an afternoon in Paris. Tiramisu - imagine your body enveloped with the complexity of moist cake and chocolate with just a touch of coffee in the background... Yummy!! 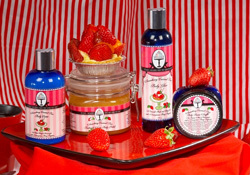 The Body Patisserie was created to nourish and moisturize the skin, while still being fun! Once you try it, I'm sure your skin will be pleased! Intro Special - 20% off 2 or more items. These make great stocking stuffers, hostess gifts or "just because I love you" gifts! Treatment of the Month - Get A Gift for After the Holidays! Purchase a Brazilian wax or facial in the month of December and receive a $15 gift certificate to be used towards any service in January. That is my little holiday gift to you! You must mention this offer when you come in for your service! Remember, you can now purchase gift certificates on line at http://www.RaspberryMoonST.com. Go to the store and then click on gift certificates. Great idea for a last minute Christmas present!